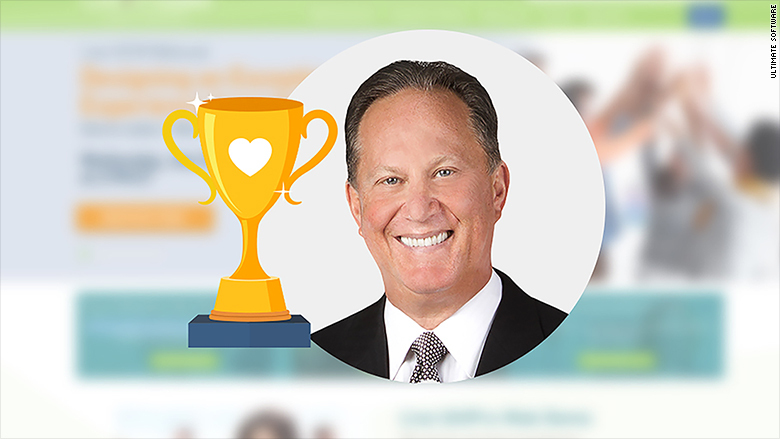 Scott Scherr just became the most loved tech CEO in the nation. You probably haven't heard of him, but according to Glassdoor, Scherr has a 99% employee approval rating, besting Facebook's Mark Zuckerberg (who came in second with 97%). Scherr runs Ultimate Software (ULTI), a $6 billion company that makes cloud-based products for HR and payroll. "I feel humbled," Scherr told CNNMoney. "I think [employees] trust me to take care of them and their families." He attributes his ranking to the company's benefits and the people who work at Ultimate, which is based in Weston, Florida. Along with fully paid health benefits, Ultimate matches 40% of 401(k) contributions with no cap and gives all employees equity when they're first hired with the opportunity to earn more based on performance. All of these benefits have been "non-negotiable" since the company was founded in 1990, according to Scherr. That may be why Ultimate Software says it has a 95% employee retention rate, which keeps customer retention rates even higher -- at 97%. "Commitment to employees and their families is unparalleled. Professionalism and delivery of superior service to customers is expected and delivered," one anonymous reviewer wrote on Glassdoor, a job and salary review site. There can be a downside to the employee loyalty: It's hard to get promoted unless "you do your 'time,'" another reviewer noted. When looking at all industries, Scherr ranks second on Glassdoor's Highest Rated CEOs list, and Zuckerberg ranks fourth. Bob Bechek of Bain & Company and Dominic Barton of McKinsey & Company were first and third, respectively. Jeff Weiner of LinkedIn (LNKD), Marc Benioff of Salesforce (CRM) and Sundar Pichai of Google (GOOGL) rounded out the top five tech CEOs. Last year, Larry Page was at the top of the list, when he was still leading Google. Page is now CEO of Alphabet, Google's parent company. Glassdoor looked at global companies with 1,000 or more employees and ranked CEOs based on approval ratings and reviews from U.S. employees. Scherr founded Ultimate with three other employees -- all of whom are still with the firm.